The first couple of hours of the 2018 event was dogged by the usual early-season delays, mainly due to the wet track. The rain eventually stopped and the track dried, and the event ran to its proper conclusion – the Top-12 run-off completed with about 5 minutes to spare before the curfew at 1800. A warm thank you from the organisers to all competitors for supporting the event and for your part in keeping it running on time, and if you were marshalling on the event, thank you for your invaluable contribution to the day’s proceedings. The full results from TSL for the 2018 Great Western Sprint are here. 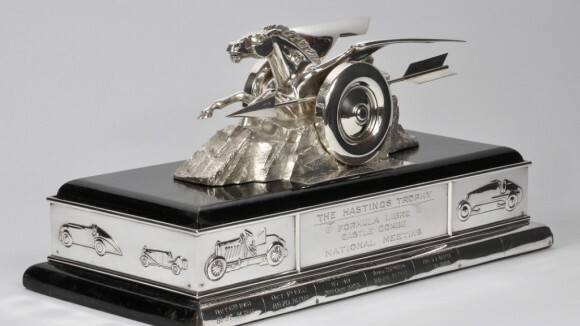 The principal trophies presented for the Great Western Sprint are The Hastings Trophy for Fastest Time of the Day, and The Castle Combe Plate for the Best Performance by a Bristol MC member. Congratulations to all award winners, especially to Heather Calder on a fine FTD, and on setting a new record in the run-off. We hope you all enjoyed your day’s motorsport and look forward to welcoming you back in 2019. Event Secretary Ady Taylor 07957 545432. Results of the 2017 Great Western Sprint for comparison.